What Are Anatolian Cave Houses? If the thought of sleeping in cave houses inspires visions of hunting woolly mammoth with a sharp stick like a caveman, you’ve never been more wrong! 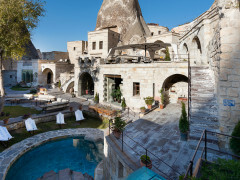 The Anatolian House Hotel is a series of beautiful ancient stone dwellings and caves painstakingly carved into the rocks of Cappadocia in Turkey. The pictures look breathtaking and simply have to be seen to be believed.